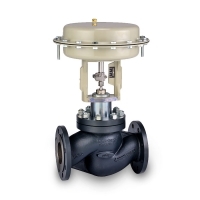 VD10 Serie is a two ways, single seat valve type with body material in Ductil Iron GGG40.3 PN16, designed to satisfy most of the medium/low pressure conditions to control fluids as steam, water, oil and other different general industrial medium. VD10 valves are designed to control a broad variety of fluids, like steam, water, most of the medium and gases. One of the main features of this serie is the top guided construction that assure a stable plug travel over entire stroke of the valve minimizing vibration and wear.